Forest-loving groundcover. Leaves from a terminal whorl. 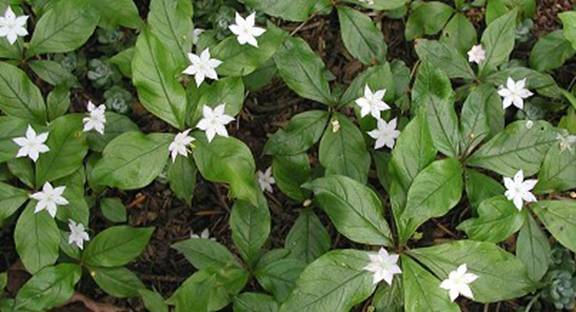 Grows 6-12 inches high, from small tuberous rhizomes. Conspicuous white flower is suspended upon an extremely thin stem, giving the illusion that the flower is floating above the plant. Asexual reproduction by tubers is more important than reproduction by seed. Collection Restrictions & Guidelines: Collect seed in late summer, rhizomes in fall/winter. Susceptible to Sudden Oak Death Syndrome, and as such all parts of this plant are quarantined in Northern California. Do not remove from quarantine area. Recommended Seed Storage conditions: Air dry seeds for late summer planting. Stratification results in delayed germination and extended germination time. Propagation Recommendation: Sow seeds in flats in late summer. Cover with 1/8" soil. Moisten soil. Alternatively, propagate by divisions in early spring. Care Requirements After Installation: Water weekly if winter and spring are exceptionally dry, otherwise, water once upon installation. Growth Rate & Lifespan: Can be expected to live 3+ years. Dense patches will persist indefinitely and will expand as a self-sustaining colony. Anderson, Roger C. and Orie L. Loucks. Aspects of the biology of Trientalis borealis Raf. Ecology: Vol 54, No 4, pp. 798 – 808. Pojar, J. and A. MacKinnon. Plants of the Pacific Northwest Coast-Washington, Oregon, British Columbia and Alaska. B.C. Ministry of Forest and Lone Pine Publishing. 1994.